President Michael Chilufya Sata has recalled almost all diplomats in foreign missions who were sent before he became President or were appointed by former President Rupiah Banda. The President is said to have a list of over 100 diplomats on the verge of recall and so far over half diplomats on the list have received their letters of recall. Close sources say that the President himself is compiling the list to ministry of Foreign Affairs to put dare stamps and append signatures. The letters of recall are still being sent as more and more diplomats continue confirming receipt of the same. The exercise is ongoing and may take some time before everybody is recalled as it involves replacing them with PF cadres. 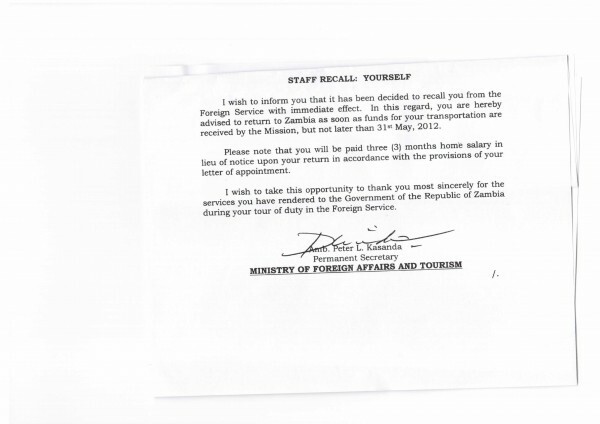 The recalled diplomats have been instructed to be in Zambia with immediate effect, but not later than 31st May 2012. Here is the template of the letters of recall that are being sent to everyone being recalled by President Sata.